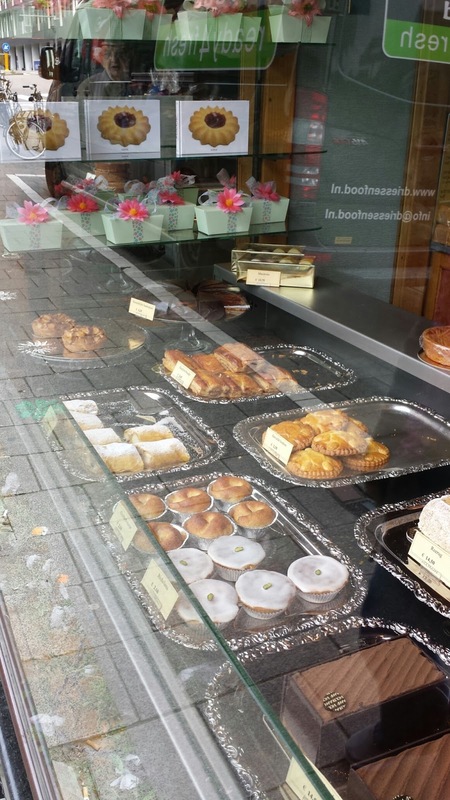 One afternoon, I think it was the Monday we got to Wassenaar (where my grandmother lives in the Netherlands) and I happened to go in to the local bookshop just to leaf through the cookery books, while Joanne was next door in the HEMA. One of the books stood out to me "De Banketbakker" (translated as the confectioner) by Cees Holtkamp. 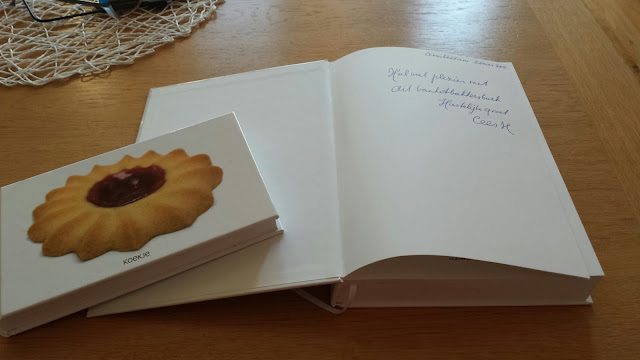 As I scanned through the book I realised that it was a Dutch baking bible, from Koffiebroodje to Krokets. It had everything I had been looking for when it comes to Dutch baking as there are not many resources online to use. Joanne wandered in soon after and insisted she buy me the book but to her dismay I wouldn't let her or at least not yet, I wanted to see if they had it online in English first. 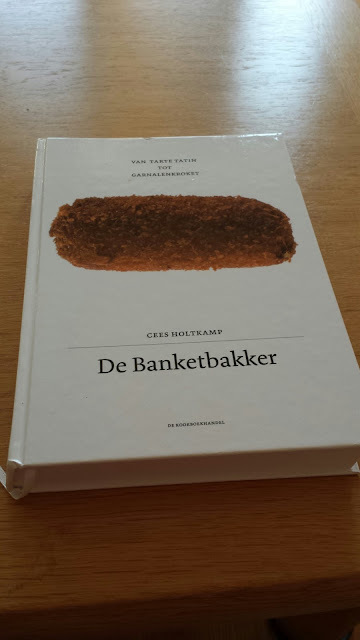 I got back to our little bungalow in Maassland that evening to discover it wasn't available in English but soon realised the guy who had wrote this wonderful book was "the" Cees Holtkamp of Amsterdam, I really had no idea at the time. After putting two and two together I suggested that we pay his magnificent bakery a visit in Amsterdam later in the holiday. Up early the following Wednesday we set out for Amsterdam. 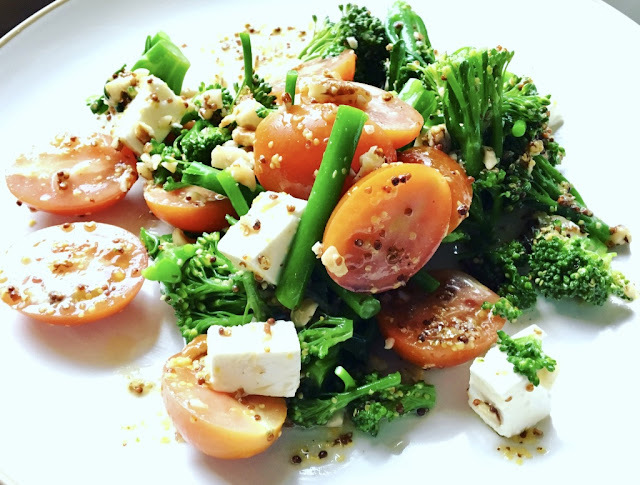 We had only been there the previous Tuesday to celebrate our engagement in Restaurant Vermeer ( I will be reviewing this stunning restaurant soon ) but now we were back again to seek out Holtkamp. We decided to walk from the Central Station to the Vijzelgracht where the bakery is located, of course Joanne stopped in every nick nack shop along the way prolonging my excitement. 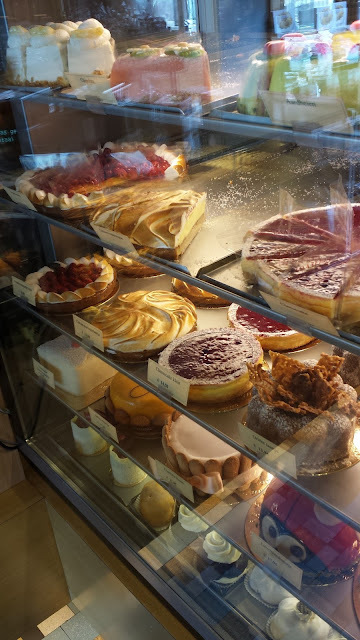 We arrived eventually and are immediately glued to the window at the cakes on display. WOW absolutely stunning creations adorned the front of the shop. However less of the looking we went in ! Ok so the next section is loads of pictures we took, the cakes were amazing, the pastries, the chocolates, the biscuits...all out of this world. Each dessert and pastry more amazing than the last. The bakery is like a goldmine, we were both stood in awe in this very small shop. I say small as it felt so cramped when we got in, 2 gentlemen were stood inside waiting but we didn't know what for. One of the guys then informed us they were here for the kroketten, Holtkamp's best seller. 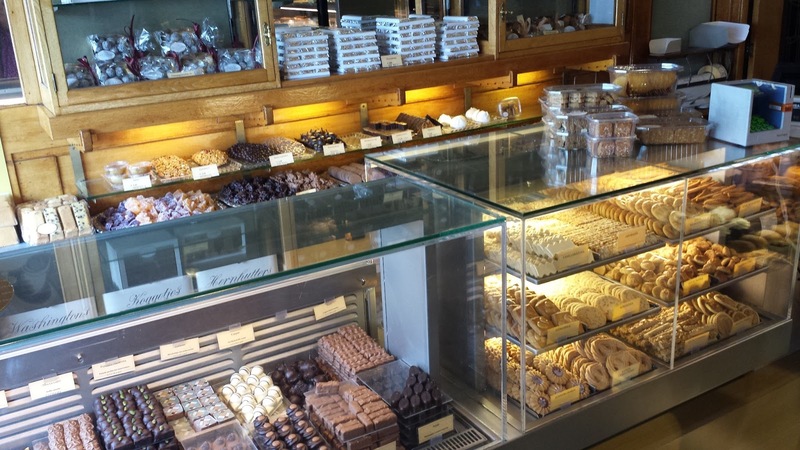 He also said he comes to the bakery at least once a week to pick up kroketten for his family. He used to work nearby and would always come 3-4 times a week for lunch, but his circumstances have since changed but still makes the effort to come much farther for these glorious savoury delights. The ragout-filled dish was regarded as a French cuisine delicacy, first described in a recipe from 1691 by the chef of the French king Louis XIV and utilising ingredients such as truffles, sweetbread and cream cheese.From the 1800s onward, it became a way to use up leftover stewed meat. After World War II, several suppliers started mass-producing croquettes filled with beef. 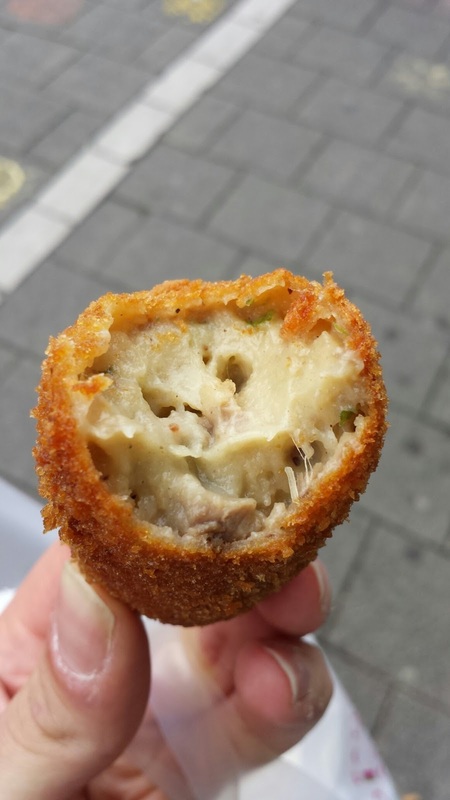 The croquette subsequently became even more popular as a fast food; meat ragout covered in breadcrumbs which is subsequently deep-fried. Its success as a fast food garnered its reputation as a cheap dish of dubious quality, to such an extent that Dutch tongue in cheek urban myths relate its "allegedly mysterious content" to offal and butchering waste. Research in 2008 showed that 350 million kroketten are eaten in the Netherlands. 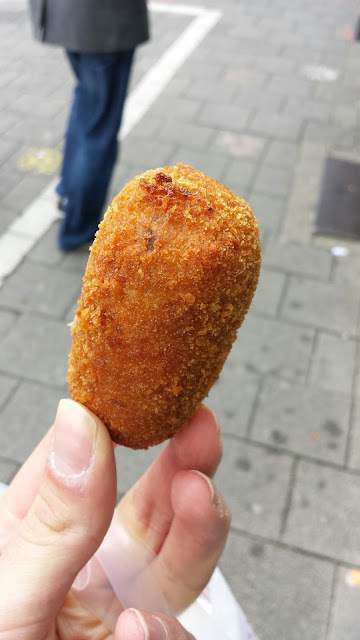 It is estimated that 75% of all Dutch people will eat them, resulting in 29 kroketten per person per year on average. The major consumers are between 35 and 49 years old. The gent further informed us the most popular kroket Holtkamp makes is the veal kroket. Now I am no stranger to kroketten so I was intrigued to see how good these babies would be. 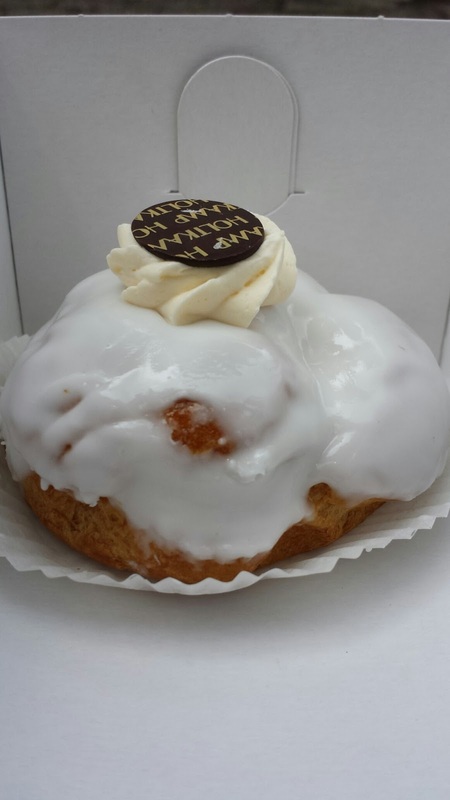 I ordered one, a pastry cream filled choux bun and Dutch strudel for Joanne. The pic above is the most magnificent kroket I have ever eaten, so flavoursome and that outside coating was yummy. The outside is twice breadcrumbed with panko breadcrumbs and deep fried, DROOL! The next pic is my sweet treat from Holtkamp's bakery, an iced choux bun filled with a vanilla bean pastry cream. 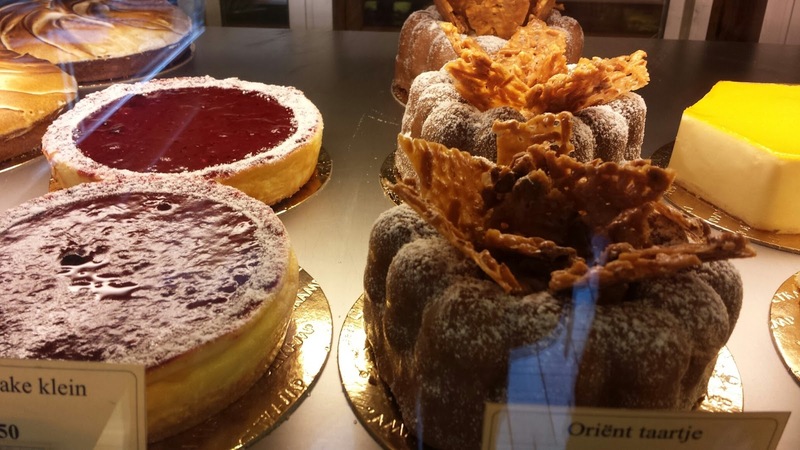 It was delicious and the pastry cream was the one of the best I have ever tasted. 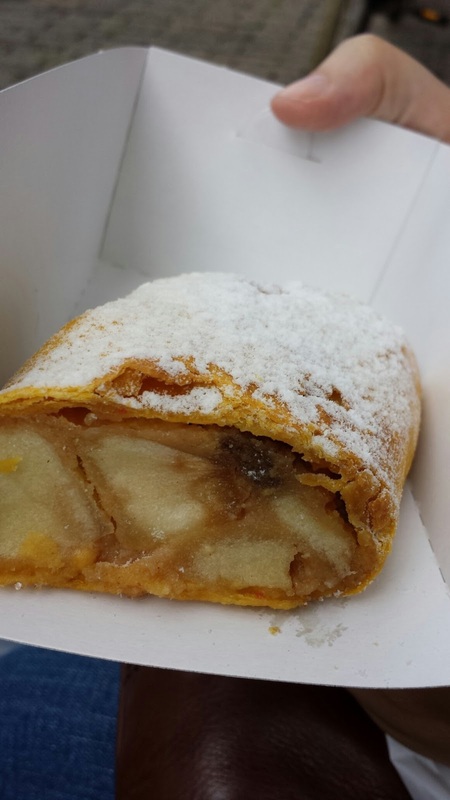 Finally then we have the Apple Strudel of which I had a taste and we both agreed that it was scrummy as Mary Berry would say. 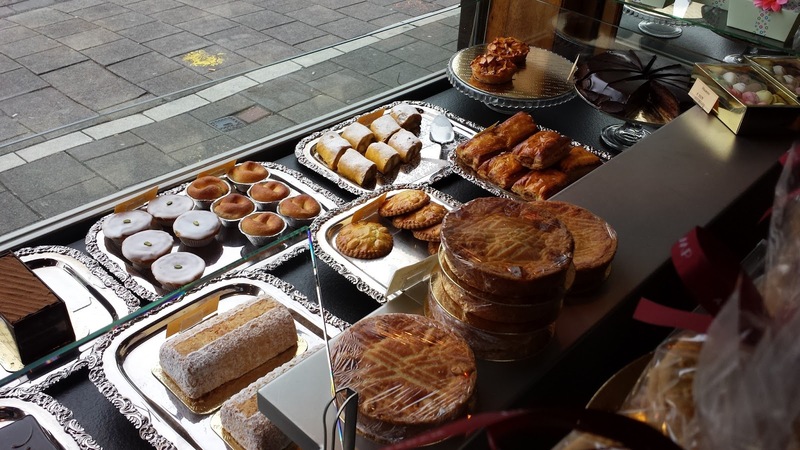 This bakery is steeped in history and what they continue to produce makes it the top patisserie in Amsterdam. 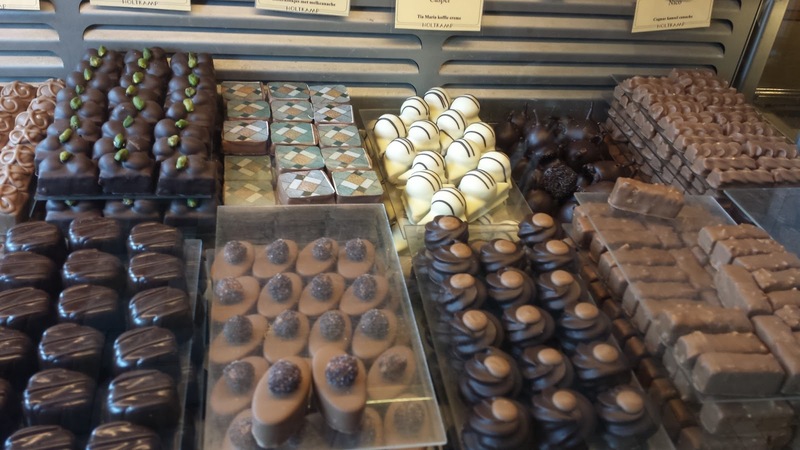 Everything looks mouth-watering, in fact if I lived there I would be popping in every day of the week to sample something new, I wouldn't care if I ballooned in weight. Just before we left to complete the symmetry of the trip and as a special treat Joanne bought me both of Cees' books and signed too! 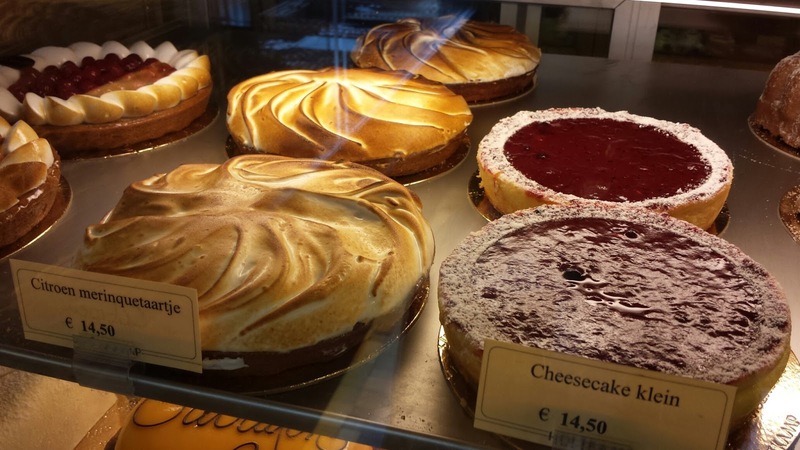 I left Amsterdam that day inspired, happy and in awe of what levels baking can reach. I spent a year living in Amsterdam and I used to live just around the corner from Holtkamp. 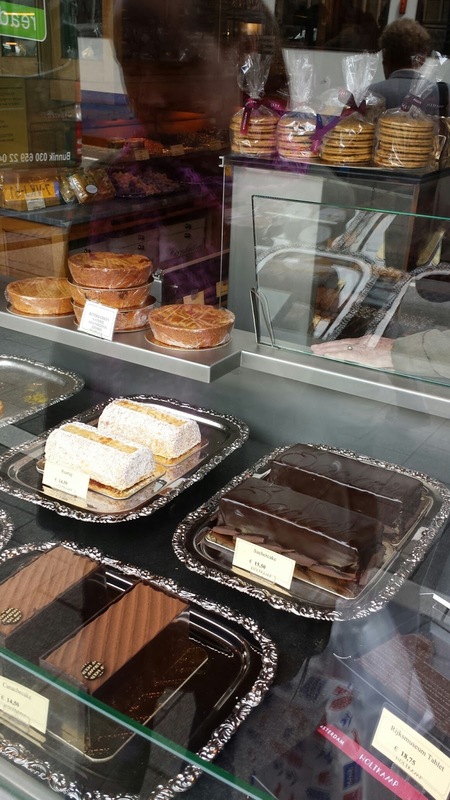 I fell 100% in love with the place and used to get up on Saturday morning to get their sausage rolls as well as some cake slices for later in the day. It is a magnificent spot and so so beautiful. 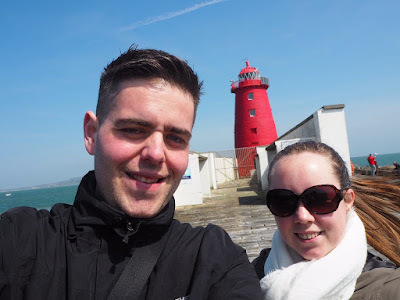 Hi Joanne, Firstly I love your blog and is my first stop for all Dublin restaurant reviews. 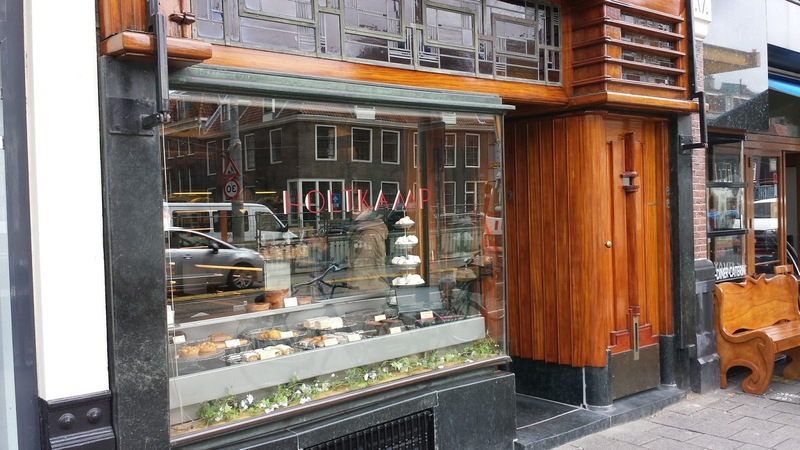 I wish I lived in Amsterdam or nearby, Holtkamp is simply amazing, however the quality and level of baking in the Netherlands is amazing too. I am going to Amsterdam for years now and I only found Holtkamp for the first time 2 weeks ago. I have walked past this place so many times and never been in. 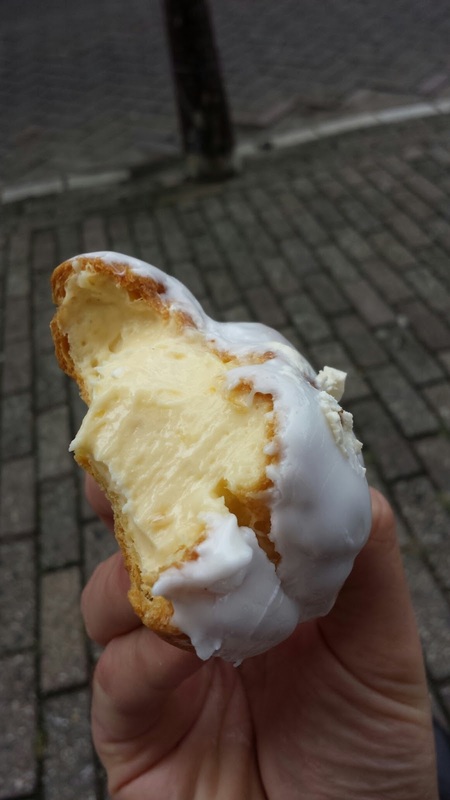 I will have to go next time I'm in Amsterdam, krokketen are one of my favourite things.